My name is Suzy Plantamura. I live in sunny Orange County, California by the beach. I have three kids, one grand baby, and two dogs. 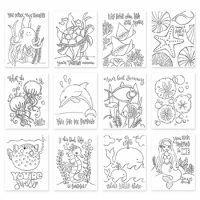 I draw watercolor cards and design stamps for Simon Says Stamp. I have a blog series called "one stamp, five ways" that I post to two times a week. I want to motivate and inspire others to use their stamp sets more and learn new techniques. I love designing products and making cards to share with others! Welcome to the LAST stop of the two day Pretty Pink Posh blog hop (((if you have made it this far haha))). On the day of the new product release, I posted THIS BLOG POST with lots of photos of colored images using each stamp set in the new release. 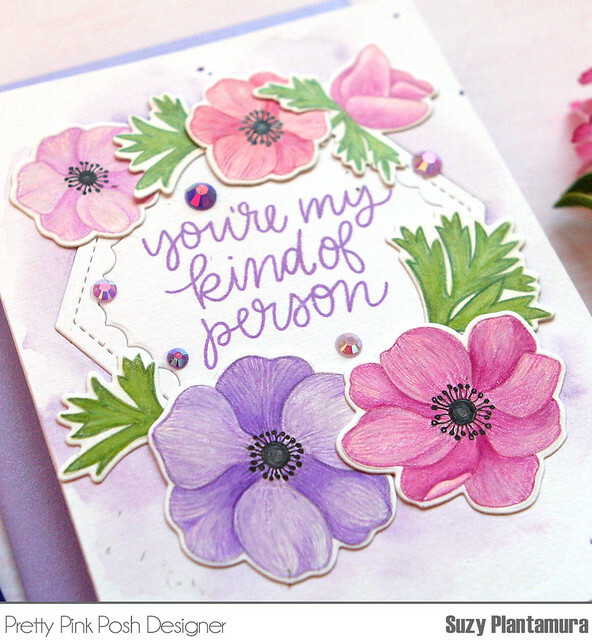 Today I have two cards to share with you using the gorgeous Anemone Floral stamps and dies. Here is an image of all of my flowers after I had colored them and die cut them out. Coloring is definitely my favorite part, so I tend to spend way to long on that part of the process! Half of the above flowers were painted with watercolors and the other half were colored with Copic markers. Then I used colored pencils on ALL of them to add details and shading. Can you tell which ones are watercolors? It is the brighter more intensely colored ones - like the bottom right side that I outlined in black marker. I stamped all of them with MFT Natural Ink for a no-line stamping look, but then I wanted the watercolored ones to have outlines, so I doodled some on. I used some of these colored flowers to make two cards to share with you today, but the good news is, I have lots of flowers left to make more cards in the future! This card uses my Copic/colored pencil flowers on white cardstock. They definitely have a softer look. I like how the colored pencils allowed me to add lines in the flower petals so the look more realistic. I added the centers to the flowers with a black fine tip marker. For the background of this card, I used the Scalloped Hexagon dies. I painted the outside piece with purple watercolor using a wet on wet technique. I left the inside white and stamped the sentiment on it with Hot Mama ink by SSS. The sentiment comes from the new stamp set called Simple Sayings Kind. I finished the card with some PPP Jewels in Pansy Purple. To make the background of this card, I started with a piece of card size white cardstock. I attached it to a craft mat and used sticky tape to tape down the SSS Tiny Dots stencil. I rubbed Moonstone Nuvo Glitter Paste over the top of the stencil so that once it was removed, it left little dots of glimmer. This is the first time I've used this glimmer paste and this is the only color I have it in. I absolutely love it - it is really shimmery and dries super quick. It works great over stencils. I liked the subtle background it created for my pretty flowers. I die-cut the word die Thankful For You out of gold cardstock. When die-cutting word dies or dies with lots of details, I use a Metal Adaptor Plate between my paper and die-cut plate. This gives you a clean cut every time! 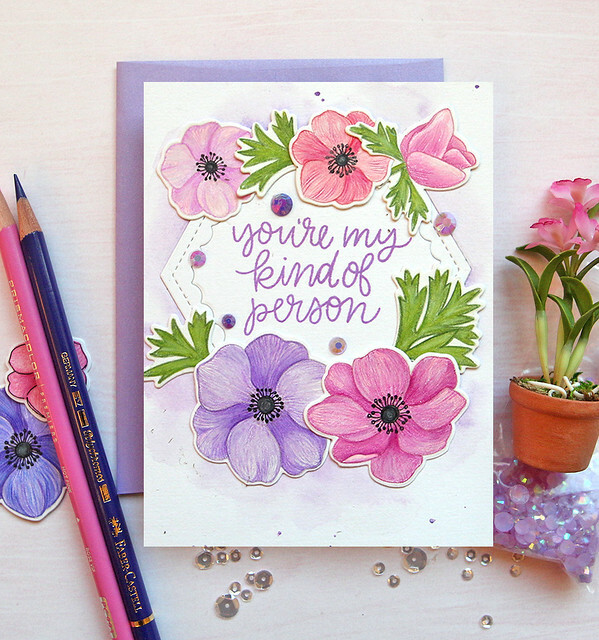 I attached the watercolored flowers over the card front and then the thankful for you words above the flowers. I finished the card with some Watermelon and Pansy Purple jewels. Here is a list of all the hoppers on today's hop. If you go to the PPP blog you will see the list of the hoppers from yesterday's hop as well. There are 4 $25 gift certificates up for grabs (two winners each day). Winners will be picked randomly along the blog hop. Comments must be left by 11:59 PM PDT on 9/18/2018. Winners will be announced on the PPP blog. Your coloring is inspirational! Gotta keep practicing I guess! You're card is absolutely amazing! WOW - these are fabulous! They would look great in many colors - but purple is my favorite, so I really love them! Awesome! You certainly did a wonderful job coloring these flowers and making lovely cards. Well... those flowers look so realistic, I think I could pick some. Well done! Your beautiful card is filled with so many detailed techniques. Thanks for sharing. Beautiful coloring on these sweet cards! Beautiful cards, such an amazing pile of beautifully colored flowers!! What a gift you have for coloring. Those flowers are beautiful and perfect to create stunning cards with! Oh my gosh. So many beautiful anemones! It would take me hours to color that many in pencil! I've been practicing with my Prismacolors, but still have a long ways to go to have it be easy, lol. I love seeing your no-line coloring. Gorgeous! The coloring of the flowers is gorgeous. You never disappoint! Love these beauties and the bright colors. Nice, the coloring is great, the flowers are so useful and it would be nice to have some extras around. thanks for sharing. Bold shift in colour selection but so lovely. Watercolored or with Copics, they are both beautiful as are your card. Wonderful job. Oh Suzy, I could never colour as well as you do. Want to come to my house & teach me? lol You could come to the west coast of BC for a holiday. :) I know, dream on... 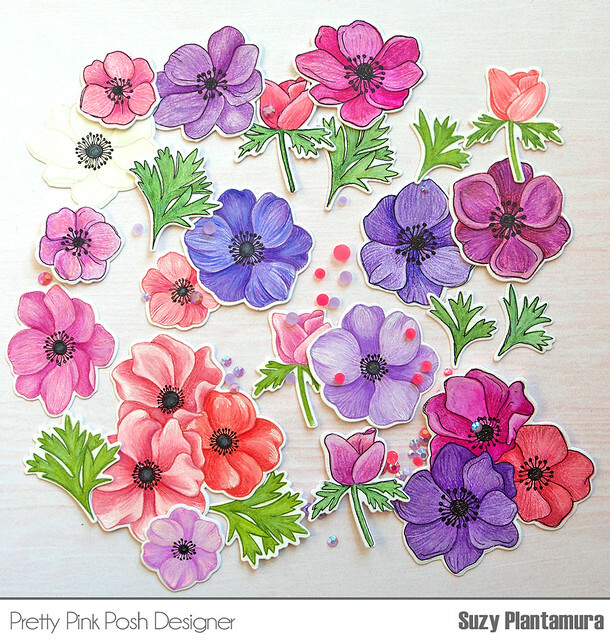 It definitely shows when you say you love colouring & these anemones are beautiful with more of a bold colour on them as well as when they are soft & pale. Love the detail on your card. Beautiful coloring! I really like your cards! The veins of the flowers are the BEST! And with the flowers, the gold sentiment makes the card so elegant. Your coloring (both watercolor and Copic) is beautiful!! I always love your coloring - it's so pretty! Omgosh! Your colouring is so fantastic!! Beautiful cards!! Love this stamp set.